Ad Blocking in the Internet Explorer 8 web browser is not as easy to achieve as it is in other web browsers like Opera or Firefox with add-ons installed. Many Internet Explorer 8 users do not even know that an ad blocking feature exists in the web browser. It can be easily accessed with the help of the shortcut Ctrl-Shift-F which will open the InPrivate Filtering settings. It is however not as easy to use as it will only allow to block elements that appear on multiple websites. This can be either automatic or manual. There is however no obvious way of blocking an element on a single website right away. 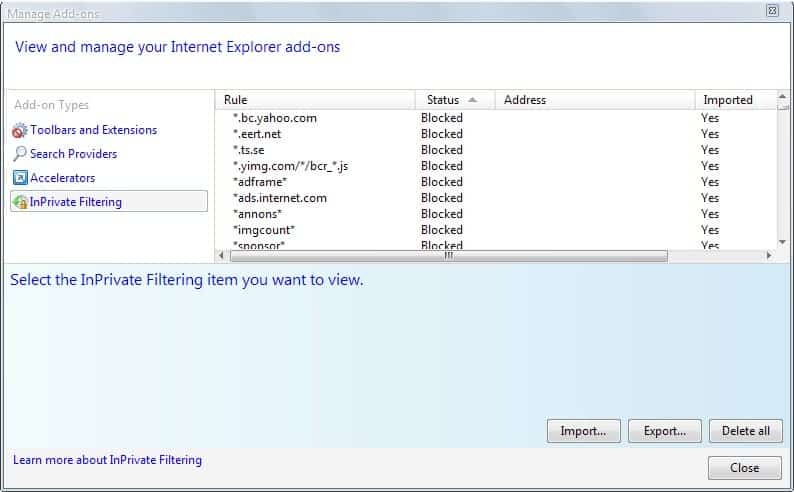 A user of the DSL Reports forum has converted the Adblock Plus list of blocked advertisement into an XML format that can be imported into Internet Explorer 8. All that needs to be done is to download the xml file from the website and import it into Internet Explorer 8 so that all of the ads and ad providers on that list are blocked automatically in Internet Explorer 8. The file has a size of no more than eight Kilobytes and can be imported into Internet Explorer the following way after downloading and unpacking it. Access Tools > InPrivate Filtering Settings from the toolbar menu. A click on the Advanced Settings link in the lower half will open a new window that can be used to import filters in xml format. The xml list can be imported easily by clicking on the Import button and selecting the xml file from the local hard drive. A message should appear notifying the user that the list was successfully imported. The main window should be filled with blocking rules after clicking ok. The ads will now be automatically blocked in Internet Explorer. The only problems with this approach are that there is no way of automatically updating the list in regular intervals. There is also no option to enable the list globally but disable it on selected websites. Update: Please note that the popular ad blocking application Adblock Plus is now also available for Internet Explorer. You can head over to the official website to install it on your system to benefit from the features that it makes available. Modern versions of Internet Explorer come with a feature called tracking protection. You can load tracking protection lists into the program that are provided by Microsoft or third-parties, so that you block certain types of elements on the web. 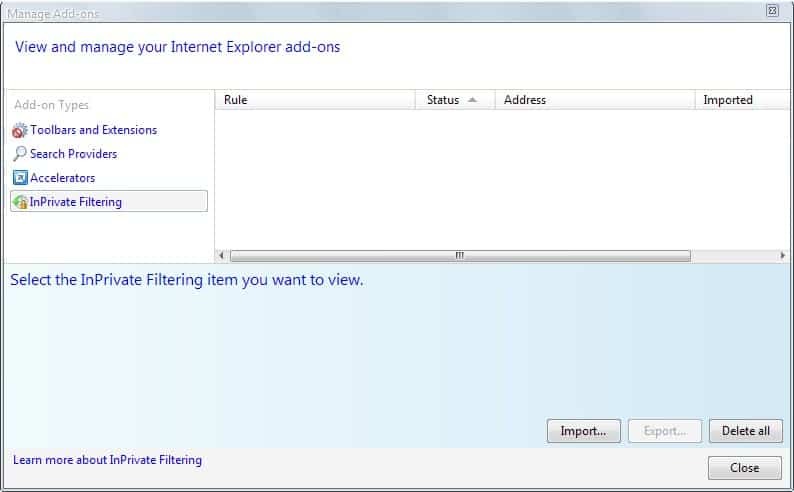 The guide explains how to add ad-blocking filters from the popular browser extension AdBlock Plus to Microsoft's Internet Explorer 8 browser. Can’t IE7Pro do this, and doesn’t IE7Pro have its own lists built in? IE7 Pro is currently not compatible with Internet Explorer 8; At least not the last time I tried to install it. Yes it does, but it does a horrible job. It will either not block the ad or it will show the position of the ad and say “click to restore flash” instead of simply removing the whole area like adblock plus does. And I tried to import the XML file to block ads, that doesn’t work at all for me. This doesn’t remove wildcards. Chrome also has this converted, its a browser called Iron. You guys should make an article on Iron. Its the pro privacy version of chrome. I’m testing the ad-blocking feature but id doesn’t seem to work as expected.. I’m using Fiddler to see exact HTTP requests and add rules for a particular website and particular hosts, refresh, make sure inPrivate is on, and still the ad shows up sometimes from the address that *should* be blocked (I verify it in Fiddler). Am I missing something here? You can also use Quero to block ads in IE8. The add-on also comes with a new navigation bar concept, combining everything into one box. It does this by replacing the address, search and find on page toolbar with the universal Quero box. You will love this concept once you get used to it, but it is also possible to just use the ad blocker of Quero. NO… this is a joke. An InPrivate hack is NO substitue for a real adblocking addon. This relies on a bastardized, and cretinously deficient, sub feature set of adblock plus format. I agree, Inprivate filtering, is to complicated to become a mainstream adblocking solution. By eliminating the ads you can enjoy faster web surfing without any disturbing ads. It also distroyes your favorite websites! Under normal circumstances, I’d agree. That said, when the ads begin destroying my web browsing experience because of poor design, poor implementation, and overall poor execution, I elect to block them. Right now, Rift advertisements are swarming over the web. Every single one of them is a full video that must be downloaded, and if the system doesn’t like it, it crashes the browser, and this was more common in Firefox than other browsers, so long as they didn’t use AdBlocker. Normally I’d just deal with ads because I know many sites rely on them, but those ads are freezing my IE. Sorry, but if I can’t look at the site, they won’t get paid for the adview anyway. You can say that again??? IE is hopeless. Throw it out already.